The perfect finishing touch for your "Resto-Mod". Machined from a solid block of billet aluminum. Features our black button head screws and our quality internal components. Security cable included to deter theft. 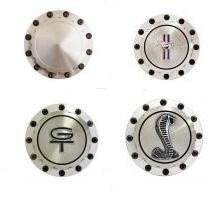 Available with several types of emblems and also in black anodized. Will not fit 1970 cars with California emmissions.